To round out the week of Tim Tebow, here is one last blog post based on his message (since it’s a good point and since I don’t ever want to forget anything he said). How do you define yourself and find your value? I’ll be honest, this is something I’ve struggled with for years. I know the Christian answer is, “I’m a child of God,” and value comes from knowing who you are in God’s eyes. And I believe that is where we should find it, but it has always seemed so abstract to me. What does that really mean and look like? I think the answer of how we define ourselves varies for each person. If you’re single, perhaps you define yourself by how many dates you go on, if you’re in a relationship, or even how many Tinder matches you get (guilty on all counts). If you’re married, maybe its by how strong your relationship with your spouse seems to be on any given day. Maybe you place all your value in your work performance (I had a college professor flat out tell me once I needed to define myself by more than just my grades, as I cried in his office over (an unfairly) low test score), or your friend network, or your fashion sense… (I’ve shared before that I feel completely inadequate to write a fashion blog, so the value I place in myself based on that goes up and down like a roller coaster). Tim gave an example of his own life where he was, in the same year, voted one of the most popular athletes in America and cut from his team. Obviously, that had the potential to put him on the aforementioned proverbial roller coaster. If he derived his value and meaning as an individual from those outside forces, he would have faced an identity crisis that year, as he was forced to choose which definition of himself to believe – that he was a beloved athlete, or that he just wasn’t good enough. However, Tim doesn’t define himself by how other people see him. Instead, he is confident in who he is in the Lord, knowing that God has a special purpose for his life, no matter what others may say, think, or do. And that’s true of all of us. Whether we are promoted or fired, His plans for us are good, to give us a future and a hope. No matter if we have 5 facebook friends or 5,000, He promises He will never leave us or forsake us. 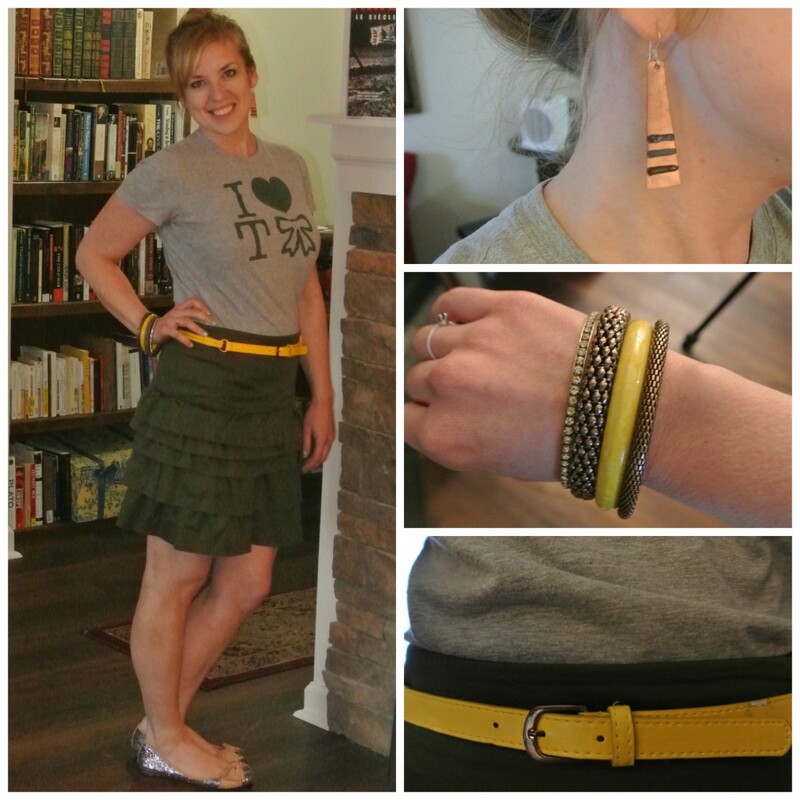 If our fashion taste is lauded by InStyle magazine, or bemoaned by Stacy London, God still enjoys our creativity. And even if every Saturday night is spent at home alone watching Netflix with nary a text message alert, His opinion of us is still that we are lovely. How are you defining yourself? This is a journey that I am still on; even as recently as a few weeks ago, one of my friends kindly commented on my (above-average) need for validation, drawing my attention to the fact that I still have a long way to go in understanding God’s love and what that really means for my life. But, I’m working on it. I don’t want to be defined any more by outside forces that change with the wind. Rather, I want to have that peace that comes from knowing you are deeply loved by a God who never changes and knows absolutely everything about you, yet still calls you His own. Is this something you struggle with? If so, what are some of the steps you can take to define yourself in a healthy way? If not currently, but you’ve dealt with this in the past, what were some of the ways you learned to define yourself according to what God says, rather than what the world says? What is your favorite promise from the Lord about how much He values you and who you are in Him? Let’s celebrate ourselves today! Have a good weekend everyone! I don’t know how many of you follow me on Instagram, but I’ve been doing this super fun style challenge over there. I guess you’d call it microblogging, if that’s still a term. Anyway, head on over and follow tastefullytrendysb for advance looks at some of my outfits, as well as some things that will never make it to my actual blog. I’d love to connect with you! And now, for the matter at hand. Yesterday, I got to hear Tim Tebow speak at a church in Knoxville. It was super inspirational, and I’ll be talking about it more in the coming days, I’m sure. But today, let’s talk about how difficult it is to pick out an outfit to meet one of the most well-dressed men in the US. Of course, we didn’t actually meet, but I had to prepare for any situation, and since my seat ended up being on the 4th row, I’m so glad I picked something that stood out – like BRIGHT yellow. Naturally, when I posted a picture on social media and tagged Tim in it, I was doing so from my phone and accidentally picked the one where my mouth is distorted and the dress looks too big. But, whatever. The better picture now lives here, and that’s more important, right? What do you think of my choice? Appropriate and noticeable enough without being too much? Or none of the above? 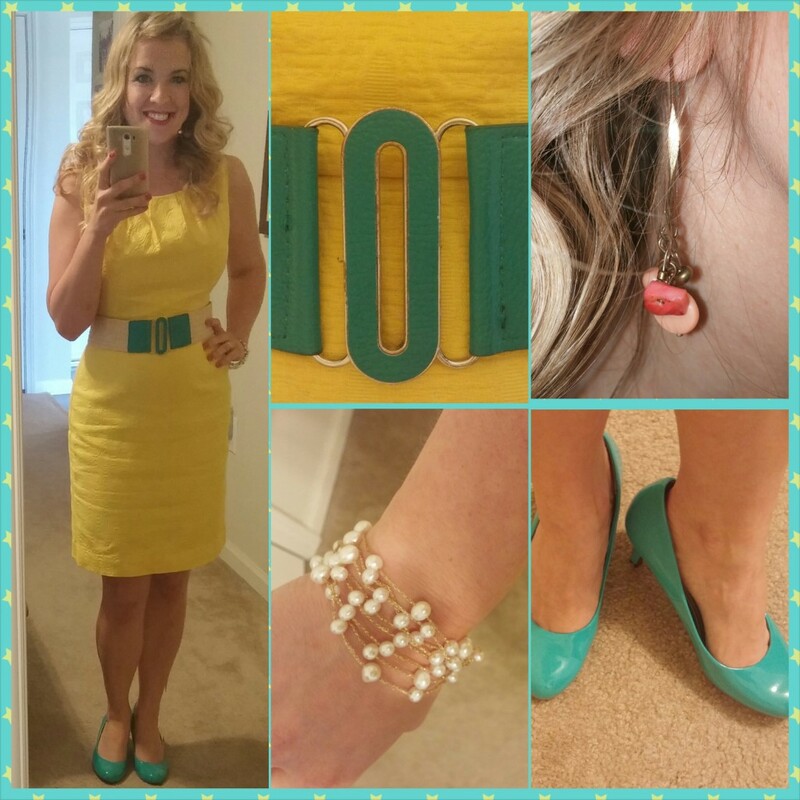 How do you feel about my Easter egg color combo? Can’t wait to hear from you! Shoes: Payless – I really do love their comfort line. They are actually comfortable, cute, and these were only $15, so if they only last a season or two, I’ve still got my money’s worth. I don’t know if you’ve noticed this (sarcasm font), but I can be a bit dramatic. My parents used to make fun of me because when I got really mad as a kid, I would literally stomp off to my room, making as much noise as humanly possible. I did this long into high school. I went on a date in hopes of distracting myself; it didn’t work. I ordered cheesy bread for lunch as a way of drowning my sorrows in garlic butter – I only got through about 1/8 of the order. But, you know what did work? What always works: going to the Lord. I’ve read those words dozens of times without them meaning much. This time, though, I felt the Holy Spirit encouraging me that He would strengthen my little broken heart. He saw my tears and instead of saying, “I told you so”, He said, “Come to me, spend time in my presence, and I will heal that heart and make it whole again.” I usually read “wait on the Lord”, as a command to just keep being patient – the good persevering Christian soldier. But, this time, I read it as a call to bask in God’s presence, as He takes what is broken and puts it back together. God cares about my broken heart. When I cry, He cries with me. There are no stipulations to His compassion. Nowhere in the Bible does it say He only cares about people who are mourning death, or people who have been victimized, or people who are sick. No matter why we grieve, He grieves with us. He cares about each one of us, and the things that are close to our hearts are close to His. Something that is close to my heart, as you all know well, is Tim Tebow. This may sound ridiculous, but I’m trying to make a point, so stick with me. God (and everyone else) knows I love Timmy, and in the midst of my sadness, God reminded me that He still cares about what I care about, prompting a friend to give me a ticket to hear Tim speak in Knoxville this Sunday. Not only did God not punish or condemn me as I was expecting, He gave me the opportunity to do something I’ve wanted to do for years. Most likely, Tim will not look out over the congregation and see a divine arrow pointing at my head, indicating that I am the one God has chosen for Him. We probably will not meet at all. But, still, God knew hearing Tim speak would be really special for me, and I believe He gave me the chance exactly when He did to encourage me, reminding me that He hasn’t forgotten me, He isn’t mad at me, and He cares about my broken heart. Tim Tebow may not fix my heart, but God can, and He’s showing me little by little just how much He wants to do that. If your heart is broken for any reason – a relationship, a death, unemployment, or just life not working out like you thought it would – I hope you can be encouraged. God cares about your heart, He sees your pain, and if you’ll look for it, I know He will show you ways that He is strengthening your heart, as well. What does one wear to meet a man who dresses like this?! We interrupt this regularly scheduled programming to bring you: just a regular blog post. I was out of town for Easter, and before that, I just had a really busy week and didn’t get to my blog as often as I would have liked. So, at the risk of falling off the face of the earth for the 2nd week in a row, I thought I’d at least publish something today, and if I’m very lucky, even tomorrow and Friday. This weekend, I should be able to get back on track (if I don’t run away with Tim Tebow, but I’ll save that story for now), so next Wednesday, we’ll look at another woman from the Bible. For some reason, I’ve been on this t-shirt kick lately. I don’t honestly know where it came from, but since I bought 5 t-shirts from H&M in a week, I guess it’s going strong. I love this neon yellow I picked up recently. I’m often not a fan of neon yellows and greens – I think they veer too close to snot when you have a cold. But, I just really liked this one, so I picked it up, and then two days later, I got the cute infinity scarf I’m wearing that perfectly matched. 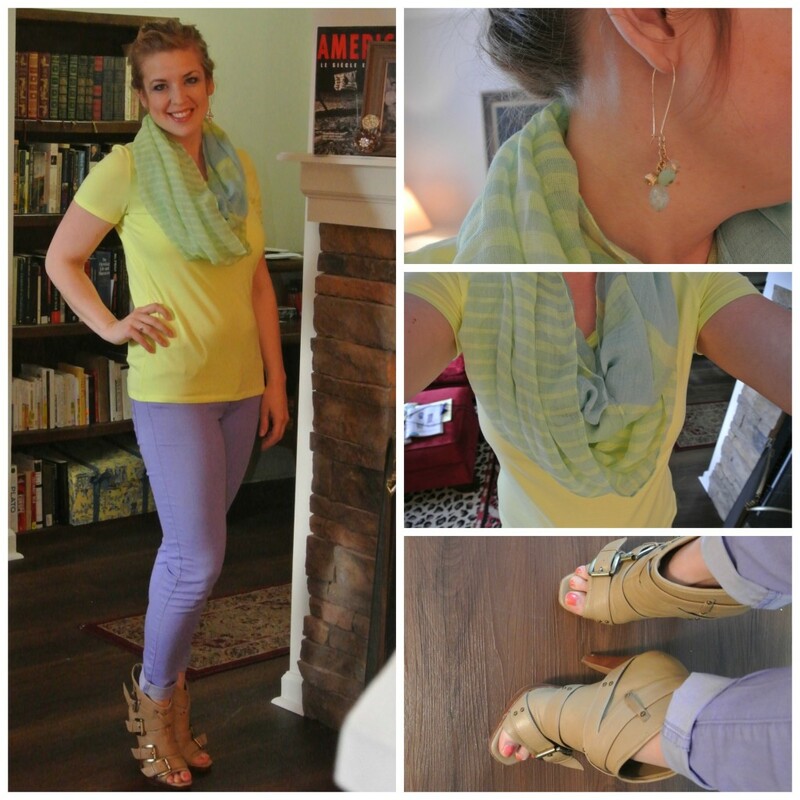 The purple jeans were a bit of a leap, but when I saw them in my dresser, I thought it just might work and went for it. 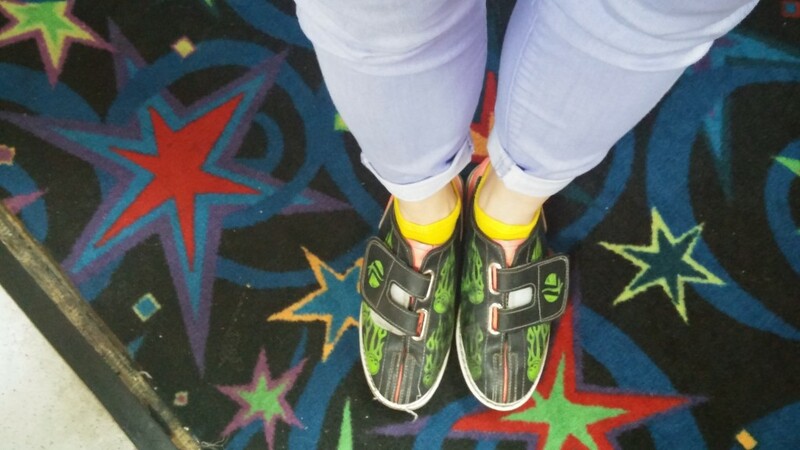 I also ended up completely coordinating with the bowling alley I went to later that night, so you know – that’s something. What do you think of my color combo? Too much, or just so crazy it might work? (I did bowl the best game of my life that night and came in 2nd place – I’m pretty sure the neons are the reason.) Also, how do you feel about bowling in general? Or about me telling you that I once accidentally threw the ball into the next lane? I had so many choices for today’s alliterative title, particularly considering the subject of my t-shirt. But, Trends and Tees won over Tebow Time. For perhaps the first and only time in my life. But instead of being relegated to family reunions, youth group fundraisers, and the gym, t-shirts are now finding places in high fashion (or at least, street style of the rich and famous). Of course, these are not the ill-fitting, over-sized, company logo shirts I’m talking about, but rather a cute graphic tee (like the bubble gum machine shirt I wanted to buy at Walgreens in Orlando. I didn’t even care that it said Florida on it. It was cute! ), or a shirt with a witty phrase (most of which are really not that witty). And they’re being paired with all kinds of things as part of the high-low fashion trend that’s been going on for a while – and which my mom simply does not understand. Right now, I’m obsessed with this company I just discovered on Facebook the other day called Litographs – they take classic books, print the entire text in super tiny font all over the shirt, and then add an iconic image from the story. It might be easier if I show you. This is the one that I want. You can feel free to buy it too – I don’t mind being twinsies. Just make sure they don’t sell out. So, I’m on the hunt for some more cute tees. In the meantime, I think my Tebow shirt will be getting a lot of wear. Which is fine with me. It may be in Jets colors, which is completely irrelevant now, but the man himself will never be irrelevant. Ever. How do you feel about the super casual mixing with the more dressy? Have you tried it, or are you more like my mom and just don’t get it? Oh, and my earrings are from Rahab’s Rope, btw. We don’t carry this particular style anymore, but you can always order something else pretty! I know its hard to believe, but I do own t-shirts. Most are sports-themed (I have a whole method/theory on meeting men by wearing sports paraphernalia – I’ll tell you about it sometime). Also, most are relegated to the gym and/or moving days. If you’d like to get your own I <3 TBow tee, you can check them out here. 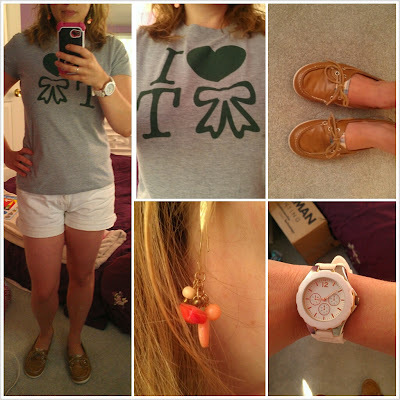 I wanted to keep my weekend look casual, but still put together, so I wore my fake Sperry’s (I really like them better than the real thing, actually – they are a little more feminine with a shorter toe), a watch, and some cute earrings that have a touch of green, but also add another color to the outfit.